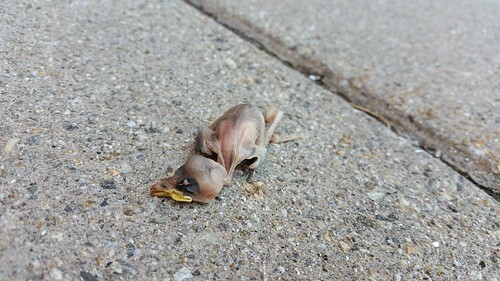 A dead baby bird on the concrete. Ok, yes, it is a morbid picture and yes, I am that person that stopped to take a picture of it. I came across it while on my walk during lunch today. It is indeed a hard thing to look at--something so young, so dead We look upon such moments with such regret of the potential that life might have held. Of course, we know this happens regularly in the abstract sense but to come face to face, is hard. What makes this particular picture more profoundly challenging is the colored texture of the chick in contrast to the ground. It's brownish body blends with the brownish gray concrete so much that it's the bird's crooked yellow beak that drew my attention intiially. In some ways, it encapsulates the intersection of human-made world and the natural world. With no natural landscape for hundreds of yards around and not clear immediate view of a nest, the likelihood is that this fellow plummeted from a nest on the building dozen of feet above. If there were grass or even other branches, could its life has been extended. It is a hard picture today, but I think hard pictures are still worth looking that to consider what it brings up in us.